It's almost midnight on the sleek streamliner known as the California Zephyr en route from Oakland to Chicago in 1954. Heading for her quarters, Zephyrette Jill McLeod walks through the Silver Gorge Pullman car, and sees something she can't explain. Is the shimmering light a ghost? Jill doubts the evidence of her own eyes, but soon learns that others have seen the phenomenon, too. 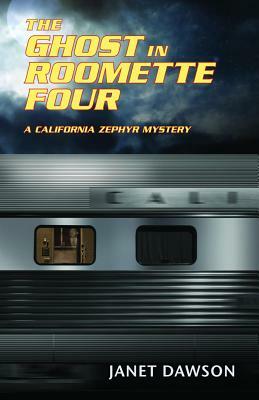 Whatever-whoever-is haunting roomette four may be connected to an incident two months earlier, when Jill found the body of a young man there. The verdict on the death was natural causes. Now it looks like the unquiet spirit is pointing to murder. Several years ago Dawson took a trip on the Pacific Sands, a privately owned Pullman car. The owner told stories about a roomette on the car that was supposedly haunted. Passengers would tell about hearing voices during the night, and the porters who worked trips talked about the porter call button in the roomette ringing. When the porter answered the bell, no one was there. As a mystery writer, anything and everything was grist for the mill. As a matter of fact, the roomette on the Pacific Sands was number four.